The M.D. 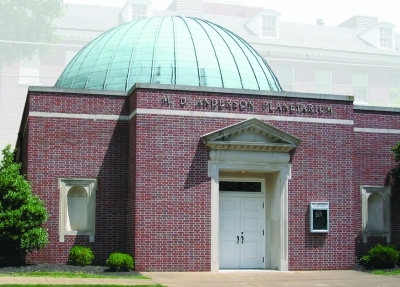 Anderson Planetarium, which I used to serve as director. Photo by Holley Wood. I’ve mentioned before that I used to direct a planetarium in Tennessee (which nobody is doing anything to reopen, as far as I can tell). One attitude I often had to battle was the idea that the planetarium shows were for kids. By extension, science topics like astronomy and planetary science are juvenile fascinations, things you outgrow as you mature. And yet: there was obviously a thirst for knowledge there among the adults accompanying children to the shows. I usually would follow up programs with opportunities for questions, and a lot of the grownups would ask far more basic questions than the kids. They needed to know this stuff, and without schools, the planetarium was the best source for answers. The planetarium I ran was a small one, attached to a small college in a small city. It wasn’t a “destination” for tourists like the big museums, but as Maggie Koerth-Baker writes in Boing-Boing, science museums in general are failing to reach adults. Go read her article right now: she has examples both of good and bad things science centers are doing. I honestly think the situation is getting better over all, but let’s face it: there’s still room for improvement. Why did your planetarium close? Thank you for raising the very important issue of the need for planetariums and science museums to reach out to adults as well as kids. The idea that astronomy and planetary science are juvenile fascinations that people “outgrow” as they mature is absolutely false. Of course, I’m not the best to comment on this; yes, I am as fascinated by astronomy and planetary science as ever, but I also admit to having never “matured” and having no plans to do so. :) Why should only parents with kids be the ones to visit science museums and planetariums? So much outreach is focused on only kids. How can voting adults possibly realize the value of science and the space program if no effort is made to educate them about it? This is especially necessary in the anti-intellectual climate promoted by certain political groups today. And the notion that adults won’t be around to benefit from space future discoveries and space missions is also a fallacy. People are living longer these days, and visions for the 2030s are as much a part of adults’ futures as they are of the futures of kids. I wonder if part of the problem is that science museums are such popular destinations for school trips. The museums encourage this, of course, as well they should, but I wonder if when the parents sign the permission slip they don’t get the idea (even if they don’t articulate it) that this place is just for kids.